ASG Chicago’s talented fashion show coordinator Jeanette Bussard’s “Larger Than Life” raincoat is featured in the Reader’s Closet section of Threads Magazine this month. 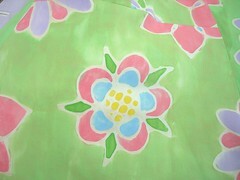 She chose the name because of the bold details that give this coat the power to overcome the dreariness of a rainy day. Jeanette lengthened the Simplicity 2645 jacket pattern to three-quarter length, added patch pockets and constructed the exterior from pale lavender vinyl with a hint of sparkle. 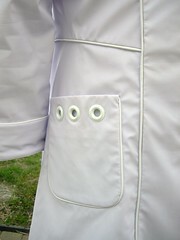 The scene-stealing exterior details include white vinyl piping, oversized covered buttons, corded buttonholes and hand-painted white grommets embellishing the pockets. 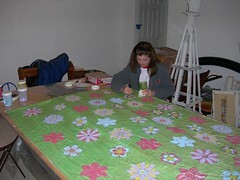 As if that weren’t enough, Jeanette created a one-of-a-kind floral hand painted silk lining using a glue-resist method. 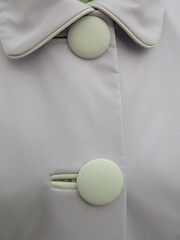 Jeanette also added a cotton flannel underlining to support the structure and add a bit of defense against the nip in the air that accompanies spring rain showers. Well done, Jeanette!